One Loaf of Rasbperry Bread! Mash the rasbperries well (I used a metal mixing bowl and potato masher - I got ideal texture. You may try a food processor or blender to puree it but I liked the very rare piece holding together ... and the masher is the perfect tool for the sexture I like. Sprinkle yeast onto warm water and let sit a few minutes until it begins to foam. Combine the yeast-water with 1 cup of mashed berries and add your salt, sugar and oil to the well mashed berries and mix vigorously. Add one cup flour and beat 100 strong strokes with a wooden spoon. Add 1 additional cup of flour and work it in then work in 1/2 cup at a time until the stickyness is gone from the dough (add only 1/4 cup at a time as you come near the end - working the dough by hand once it becomes too hard to work with the spoon). Knead the dough for about 7 minutes - until it barely sticks to your hands. Turn dough out onto your (floured) work surface. Press the bubbles out of the dough - flattening it into an oval shape. Cover it with a dish towel and let it rest for about 5 minutes. Knead pine nuts into the dough and and shape the dough to fit your baking pan. The dough's last roll on the counter is in sesame seeds (about 1/3 of the dough surface) so that the top will be coated in seed. Cover the loaf with a piece of parchment paper (or wax paper although it sticks a little more - I like a clean tea towel) and let rise in a warm, draft-free place for 25 minutes or until double in bulk. Put loaf in middle of hot oven and bake for 13 minutes. and bake for 23 minutes. After 10 minutes, cover loaf loosely with a piece of tin foil and bake for an additional 15 minutes. Tap test (tap the bottom of the loaf) to check for doneness. If tapping the bottom of the loaf yields a hollow sound the loaf is cooked. Otherwise, return the loaf to the oven for just a few minutes more. To soften the crust bag your bread in plastic for a minimum of 4 hours ... or even more but only after the loaf cools fully (minimum 4 hours). 2015 is the first time we tried this ... it was a failure the first time (lacked taste, a little pinkish in colour ... but not worth doing. The second time it was flavour rich - perhaps a little too tangy. That is the natural taste of berries. We, in our yard, have mixed varieties. Some are VERY tart! I will try this recipe again when there are enough berries in our little bush. This recipe uses the entire berry; juice, fiber AND seeds. The seed produces a nice little nutty texture to the loaf. Nothing of this spectacular berry is thrown away ... and this recipe uses an abundance of berries! I refrigerated the bread the day after baking (to prevent flavour changes and early molding - ). Toasting brought this bread alive! As to this recipe itself, we are just sharing the journey. You can enjoy (or not) the experience and even try it yourself - maybe you'll even find the best balance (or your own best balance) before we find ours. This version uses a little less yeast and contains the reminder to add a little more sugar if the berries are particularly tangy. This bread is peculiar ... it's entirely different but ... uses a GREAT fruit! It was tried as a grilled cheese. Some may like it but ... to weird, even for me. With simple butter, this bread is overpoweringly tangy. Again, "pretty weird". Cold with cold cheese is nice ... so someone said, "im gong to toast it and have it with peanut butter." That was genius. I never liked the Peanut Butter and Jelly Sandwich. Too sweet for me but this bread, lightly toasted, some butter and peanut butter and you've got the fruity flavour of the raspberry with lightly salted, natural peanut butter (and "no added sugar"). It was quite beautiful!. It made a reasonably nice deli sandwich of mustard, lettuce and dried beef salami. An Eastern-Canadian treat, Maple Butter, is also quite excellent with this bread. Again, it seems this bread is really nice (and a bit nicer, even) lightly toasted - with many garnishes. 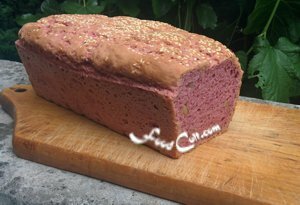 The bread holds its decidedly pink hue. The crust frames the moist berry bread slices with it's decisive tan characteristic. It's like a painting.